Back in the summer, in the middle of that crazy heat wave (remember it? ), I was contacted by the botanical drinks company Fentimans, to take part in a recipe creation campaign to help promote their amazingly delicious tonic waters. If you’ve not come across Fentimans before then you’re in for a treat. A UK brand since 1905 they brew botanical tonics and drinks in the most delicious flavours which include; Sparkling Raspberry, Lime and Jasmine and the current flavour of the moment since the Royal wedding – Elderflower. Despite the fact I was drowning in wedding cake orders it was simply too much of an opportunity to turn down and was also bound to be lots of fun… I mean, baking with Fentimans meant that gin was to be used… and gin AND cake make THE best combination. Right? I baked, experimented and photographed for hours, (failed a little with a melting gin cheesecake but got there eventually) but baking with gin and tonic became a little easier, and I can’t wait to share the recipes with you on here. For a sneak peek of what’s to come, pop on over to the Fentimans website where you’ll find details of their pop-up bakery event happening in Notting Hill this weekend… it starts Friday! So, let’s be-gin… 😉 couldn’t resist the pun, sorry!! Here’s the first recipe, a particular pretty favourite of mine. Disclaimer… I couldn’t help adding a gazillion photos at the bottom either, it’s just SO pretty… ha! 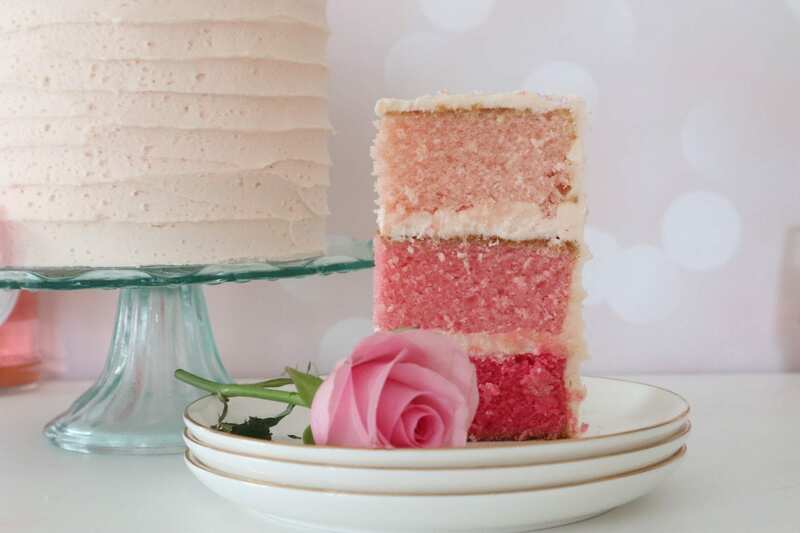 ‘A light sponge baked with ombre pink layers to match the delicate gin and rose lemonade flavour’. – sprinkles or similar – decorate as you wish! Sieve your flour and add in two parts mixing until smooth. Add some pink food gel, split the mixture equally into three bowls and add a little more to each one to create three different shades of pink. Fill each tin and bake in the oven for 30-40 minutes – test the cake after 30 minutes, a skewer should come out clean, remember everyone’s ovens vary slightly. Once baked, remove from the oven and leave to cool in the tin for 30 minutes then transfer to a wire rack to cool completely. In a bowl, mix together the icing sugar and butter until pale and smooth. Add the gin and lemonade and pipe between each layer and smooth around the top and outside. "The Most Chilled Hotel in Syracuse, Sicily"